Load-N-Haul. One person can quickly and easily load, haul and unload rental, job or landscape equipment. 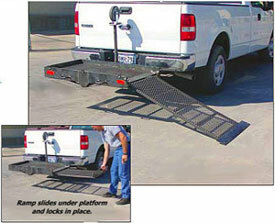 Load-n-Haul attaches easily to a standard 2" receiver and includes a handling dolly for easy one person installation. It is constructed of steel. Specs: platform 32" x 50"; capacity 350 lbs.